Renovations for the Thaddeus Stevens School on L Street were approved last month, and the aging school will be upgraded to serve children with special needs and autism. 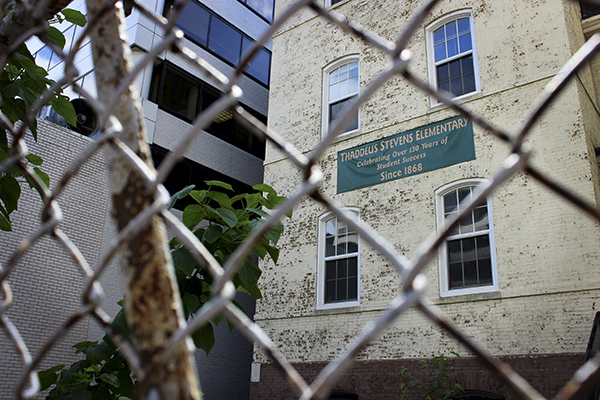 D.C.’s historical preservation board approved the designs for the renovation of the Thaddeus Stevens school last month, with the hope of opening the school as soon as 2018. The renovation, which will total about $18 million and last for about a year, will bring the aging L Street school up to the area’s zoning codes and prepare it for its next chapter as a school for children with special needs and autism. The design plans include repairing damaged concrete stairs and the external masonry, adding a courtyard garden in front of the building and putting up a statue of Thaddeus Stevens to commemorate the building’s history. There will also be a 10-story office building near the school, which will house an art gallery to further celebrate the school’s history, according to historical preservation documents. As one of the oldest public schools in the city, Thaddeus Stevens operatedfor 140 years until it was one of 23 schools shut down by District government in the wake of school closures by former D.C. Public Schools Chancellor Michelle Rhee in 2008. It has sat empty without any maintenance for seven years since then. David Toney, vice president of development for Akridge, the company in charge of developing the school, said in an interview there are some parts of the building that look “pretty bad,” like peeling paint and windows that need to be replaced. “A building built in the 1800s is not going to have a lot of things that current building codes require,” Toney said. Toney also said that the building will be made wheelchair accessible, a requirement mandated by the American Disabilities Act. He said the floors will also be leveled and the building’s ventilation system will be improved. “It will look like a brand new building,” Toney said. The new school will have a program tailored to children with autism and will include about 50 students from the current Ivymount school in Rockville, Md., said Jan Wintrol, CEO of Ivymount Corporation. Wintrol said students will be chosen for the new program based on their specific needs, and it would include students from D.C. since the school will be formed in partnership with D.C. Public Schools. “Students that come here are paid for by their local school systems because they ask us to do a program that they feel they cannot design in their own school system,” Wintrol said.